The speculation that LG is ready to release a wearable fitness tracker has hit full stride, as the persistent rumors have spawned a matching render. This wrist-mounted gadget is being dubbed the LG Lifeband Touch by the sleuths at evleaks and it sports a seemingly touch-friendly design. Its touch namesake is likely in step with the unreleased LG Smart Activity Tracker prototype that featured a conveniently swipeable LCD screen to move back and forth between metrics. Standing out on the otherwise black and ordinary-looking fitness tracker is a green circular ring. It's possible that this could determine a user's heart rate if pressed long enough. Heart rate monitors are in fashion among these, according to many, fashion faux pa devices. 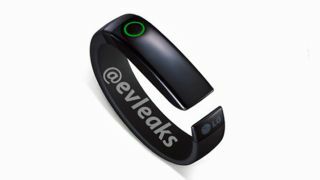 The unconfirmed LG Lifeband Touch photo closely resembles every fitness tracking device's chief rival, the Nike FuelBand SE. That's because the oval-shaped gadget appears to have a similar integrated display at the top and be made of a harder rubber material compared the softer, more flexible Fitbit Force. Nike has had an almost-two-year head start and the marketing muscle of its sneaker brand, but LG has its line of smartphones like the LG G2 to promote activity syncing. It's the route Samsung has taken with its S Health-integrated Galaxy Gear and its hopefully-not-as-beleaguered follow-up smartwatch. The LG Lifeband Touch could be announced as soon as CES 2014 or at the later MWC 2014. Time is ticking with Apple's iWatch heavily favored to arrive sometime in the next twelve months.